Your heat exchanger is a part in your furnace that allows your system to heat up the air traveling through your ventilation system. 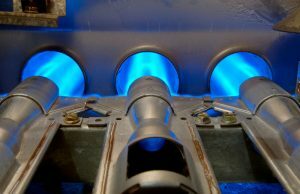 When the burners in the furnace turn on, they generate hot combustion gas that’s collected inside the heat exchanger. Most heat exchangers have a clam-shell set of tubes and coils that loop through the inside of your furnace. The shape varies depending on the type of model of your furnace system. Sometimes your heat exchanger cracks just because of age and high usage. It’s likely that you run your heater often throughout the winter and this usage adds up. Your heat exchanger heats up and cools down thousands of times just throughout one winter so sometimes your heat exchanger will just wear out as a furnace system gets older. Heat exchangers also crack due to poor maintenance. Can you remember the last time you got your furnace serviced? If you can’t then you’re at risk of hurting your heat exchanger. Skipping annual maintenance on your heat exchanger makes it more vulnerable to bigger issues. Maintenance appointments allow you to spot small issues before they become big, system-threatening ones. The last thing that hurts your heat exchanger is a lack of airflow. Dirty air filters often cause low airflow in your furnace If you’re not cleaning or replacing your air filter in your furnace every few months, start now! This is one simple and effective thing that homeowners can take into their own hands. Soot on the inside of the furnace: if you have black soot build up on the inside of your furnace then it’s a sign that your furnace isn’t burning cleanly likely due to a crack in your heat exchanger. Corrosion: when the external parts of your furnace system start to show wear and tear it’s a good sign that the conditions on the inside of your system aren’t much better. Make sure you check these components for cracking. Bad Odors: a bad heat exchanger often emits a strong, unpleasant odor due to the formaldehyde. If you notice a bad scent or realize you’re getting constant and unusual headaches, then contact a professional. A crack in your heat exchanger is so dangerous because of the potential for your system to either catch fire or emit toxic carbon monoxide fumes. This is never a matter that you should procrastinate on. Make sure you contact a professional as soon as possible. If you need a responsible technician to handle a potential crack in your heat exchanger, contact our team here at Cowboys Air Conditioning & Heating.